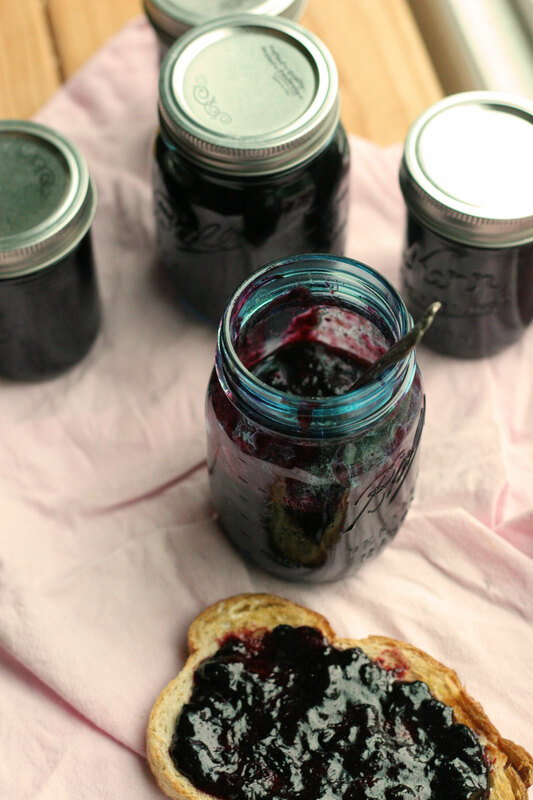 Blueberry jam is my jam. It’s a simple thing. And the simple things are what do make me happy. It’s been like that since I can remember, I enjoy the small simple things in life. A very good piece of bread, a smear of quality butter with a sprinkle of salt, and a spoonful of homemade jam. Boom, that where it’s at for me right now, and probably forever. I just took a media hiatus last weekend for my mental health. I got a massage Friday after working all day, mental and physical health, and proceeded after my massage to disconnect. You know me by now, that is essential for me, my brain, and this work. When I disconnect, I tend to reconnect to this work in a much better way. It makes me happy that I can do that, and I do do that. That is the most important part, that I actually go through with the action, not just talk about it. Friday afternoon massage, pizza dinner. Saturday tons of reading, researching, looking, and relaxing. Glorious. Sunday farmers markets, wood shops, more reading, more relaxing. We went to the farmers market to get cherries, they were gone. So I ended buying a flat of blueberries, and decided to make this jam. The idea came from last week when I was on the radio with Missy Maki here in Portland. We were discussing fruits, and berries in particular. I chose blackberry as my favorite berry. But later last week I was on TV, AM Northwest where I made a blueberry crisp, that changed my mind. I figured it out, and this is quite important, ok just kidding. Not important, but funny. Peach, like this peach galette, is my favorite cooked fruit, blueberries are my favorite cooked berry. So I saw the berries and thought after that crisp I made, I should make jam for sure. So I did, here it is. Go smear it on toast, you’ll love me for it. 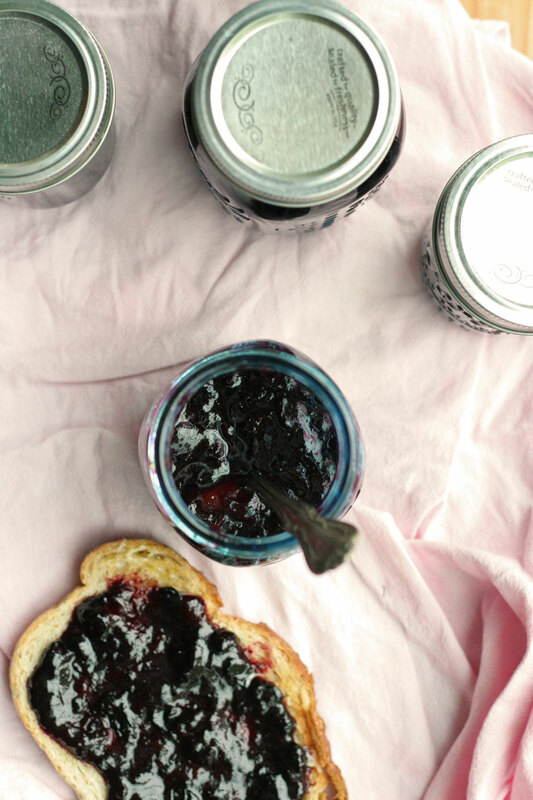 Do you make your own jam? Note: Like with any fruit cooking/baking, taste the fruit first. Adjust sugar based on sweetness. If it’s sweet, use less sugar. Not so sweet, add more sugar. I am using a slightly different method here then before. I am using a large wide pan to cook the fruit. The large wide pan allows the water to evaporate from the pan and fruit, which then allow me to use less sugar, and no pectin. You can use stainless steel or cast iron. Avoid non-stick. Get all of your canning equipment ready. Boil the pint jars and lids. Wash fruit. 1. Place blueberries, sugar, salt, lime zest, and juice in a large wide pan. Bring to a boil, smash some fruit with a potato masher, stirring occasionally. Reduce heat to medium, cook uncovered for 15 minutes, stir frequently to avoid burning. 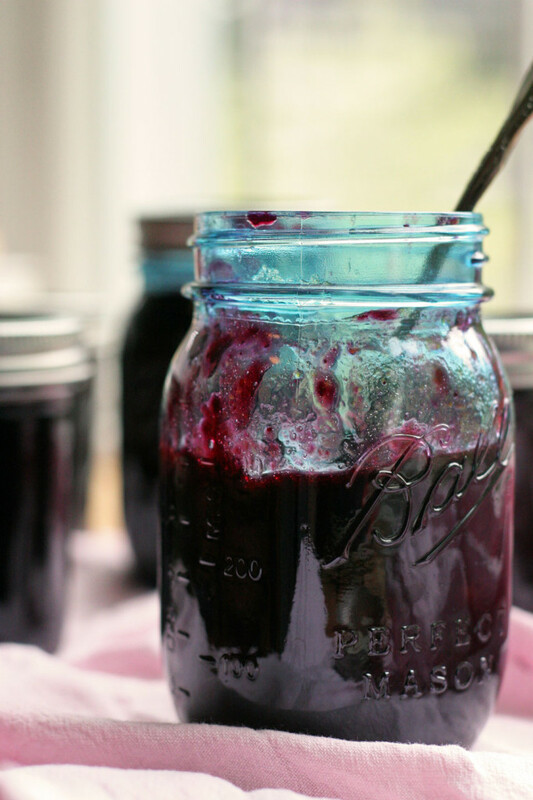 Turn off heat, ladle jam into boiled pint jars. Place lid on, and close tightly but not too tight. Place in boiling water canner for 10-12 minutes. Allow to cool on counter for 24 hours. You can also spoon the jam into a jar, and place in fridge without “canning”. The jam processed that way will last about three weeks in the fridge. Store in a cool dry place for up to one year if canned properly by using canning method. Can by following appropriate canning instructions or place in an air tight container, place in fridge for up to one month.